The West Coast Road, (Hwy 14 or the Sooke Road) runs from Colwood Corners to Port Renfrew for 95 km (59 miles) along the rugged west coast of the island. Visitors may view a fine collection of guns and cannons necessary for the defense of Canada in the previous century at the lighthouse (built 1869) and at the ruins of this 19th-century coastal fortification. 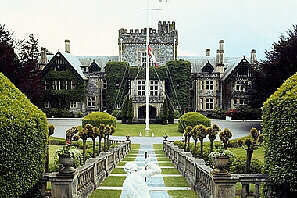 Originally Hatley Castle, this building was erected in 1980 by James Dunsmuir, son of the coal baron Robert Dunsmuir. During WW II this 263 ha (650 ac) property was purchased by the Royal Canadian Navy for use as a military training centre, once home to the Royal Roads Military College. The castle now houses the Royal Roads Campus of Camosun College and although the building itself is not open to the public, visitors may enjoy the well maintained Italian, Japanese and rose gardens. Overlooking the Sooke Harbour, Canada's southernmost harbour which is well protected from the Juan de Fuca Strait by a narrow strip of land, Sooke is a perfect spot to book boat tours from. You may visit sea caves, sea-lion grounds and heritage sites. To arrange tours visit the Edward Milne Community School. Continuing along Highway 14, you will pass beautiful beaches such as French Beach Provincial Park, Point No Point, Sandcut Beach, China Beach Provincial Park, Mystic Beach, and Sombrio Beach. The Grotto's two waterfalls and four caves serve as a retreat for west coast seals during the birthing season. During the winter these seals move to Kuitsche Sale Cove. This area is a good viewing spot for orcas, grey whales feeding, bears and eagles. This small community sits on the mouth of the San Juan River on Port San Juan at the end of Highway 14. 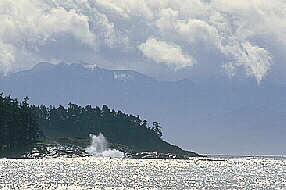 Port Renfrew serves as the southeast end of the Pacific Rim National Park from where the West Coast Hiking trail begins. This area offers great hiking, hunting, saltwater fishing, freshwater fishing and beach combing opportunities. Just beyond Port Renfrew is Botanical Beach Provincial Park, one of Vancouver Island's intriguing beaches.